Stay informed about our special offers and new products. At Quantum Cat Designs we have a fitting philosophy of comfort first, for this reason all of our dress shirts are designed to not fit very tightly. We appreciate style but value substance. A shirt can look cool, but if it is not comfortable what good is having it? Our dress shirts are fitted to have a high degree of “Slip”. “Slip” is a textile industry word meaning how much extra room there is in the fit of a garment. This product is currently in development. To receive an email when it is available for purchase, please enter your email address in the "Subscribe to Email List" box to the left. Thank you. This shirt has a bit of an art museum feel. 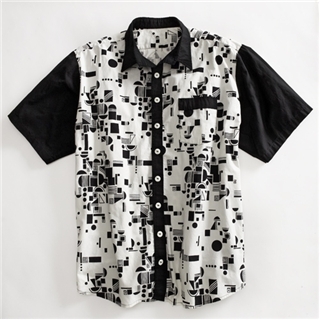 I plan on designing a line of shirts based on just black and white motifs. I imagine these shirts to be popular with the artistically inclined. This shirt makes for a great piece to wear when attending an art gallery showing. This shirt is casual, tasteful, and artsy.